Several months ago I arrived at the front door of a new Studer Group partner hospital and was met with a familiar sentiment: why do we need a "coach"? Why do we need to do more when we are already doing so much? These are fair questions, and, as a former ED director, I understand the immediate resistance to change. For the most part, ED teams are taking good care of a lot patients. But, what forward-thinking ED leaders know is this: what got us here, won't get us there. Rising patient volumes, government-mandated metrics, and limited healthcare resources are forcing EDs to take quality, safety, and results to the next level. To an ED leader reading this, I don't need to explain all of the challenges your teams are facing every day. What I can share is insight from the positive work and inspiring people I encounter as a coach with Studer Group's specialized emergency department team. 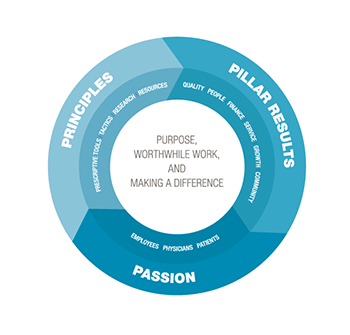 Of course, bottom-line results are part of what we do, but the core of every strategy and tactic is the understanding that healthcare professionals are driven by purpose, worthwhile work, and making a difference. At the heart of everything we do at Studer Group is a focus on people - patients and their families, staff, and physicians. In many of the Studer Group partnerships we've been a part of, one of the greatest rewards for leaders is the opportunity to become a better leader through professional and personal development. In a large health system in the Northwest United States, we took an existing partnership to a new level through the development of the ED nursing director. She was widely respected for her expert clinical skills but admittedly lacked leadership skills to do the important work of leading a large level 2 trauma center. Through the implementation of tactics to build collaboration between the ED, lab, and imaging, we improved care for thousands of patients while developing a true partnership between departments. Through skill building, mentoring and coaching her management team, the ED nursing director advanced to a VP position all while her emergency department continued to thrive. One thing we know for sure is that results don't happen because of tactics. They happen because of the commitment, passion and skill of the teams executing the tactics. Several months ago we began a partnership with an emergency department that had implemented multiple new initiatives on their own but were still performing at a level that ranked them in the bottom ten of all EDs in their large system. New behaviors and tactics simply were not sticking, and their results reflected that variance. As a next step, the organization engaged Studer Group in a coaching partnership. When I arrived at this ED, the medical director was understandably skeptical and burned out on new initiatives. Despite initial resistance, we got to work, and we were able to put structure around the tactics and strategies the ED team had tried, but up to that point, had been unable to sustain. Their results began to improve, and the director and I began building a strong and close relationship. Those initial results refueled everyone's passion for their work and their desire to keep getting better. Today, that ED ranks in the top 20 among more than 150 ED facilities in their system. The key ingredients of successful ED change management - leadership commitment, professional development, effective coaching, and a clear focus on mission, vision and values - are all contributing to a transformation underway at Ottawa's Hôpital Montfort. Over the past year the ED at Montfort has been demonstrating significant improvement across indicators ranging from arrival to triage times, to patient satisfaction ratings, to cost per visit. Coaching has helped to maintain a focus on priority goals and access to key resources and supports for leaders at all levels, including during periods of leader transitions. Of all the progress we've made in our emergency departments over the past few years, the most important element is the patient's perspective. I can't help but recall the very personal experience of carrying my 2-year-old daughter into my own ED where I worked as a director. She had suffered a terrible accident in our home. We were covered in blood and frightened beyond words. The ED staff took exceptional clinical care of my little girl, but most importantly they treated my family with compassion, care, and love. This month my daughter started college as a nursing major. The work we do is not just about improving metrics. It's about helping people make healthcare better. Even the best athletes in the world rely on a coach to help them maintain or improve performance. Studer Group coaches offer that same support to healthcare organizations who are constantly working to create the best places for patients to receive care. To those of you always striving to do better and stay inspired as healthcare continues to change, I offer a heartfelt "thank you" for the difference you make every day. The Healthcare Flywheel® illustrates the power that Purpose, Passion, To-Dos, and Results have in creating momentum in an organization. Jeff Wood, RN has more than 30 years of experience in a variety of settings including emergency departments, trauma services, air medical transport and national physician practices. As a member of Studer Group's Emergency Services team Jeff has worked with more than 250 emergency departments across the U.S.